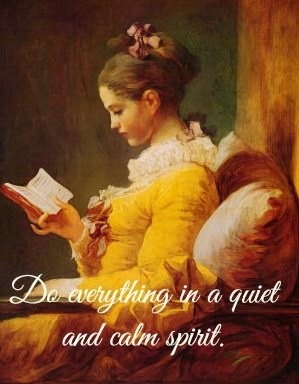 do everything in a quiet and calm spirit. Things are pretty much frozen in my garden now. I did spot a little squirrel snooping around our yard the other morning. It's not a usual sight to have squirrels here in our backyard, so I decided to leave a treat for the bushy-tailed fellow, snitching some fat peanuts from Hubby's personal stash. Except...there has been no further sighting of my bushy-tailed acquaintance. 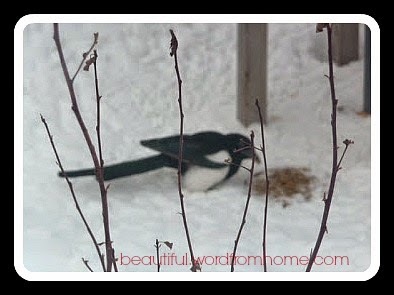 Instead, a rather large magpie spied the peanuts, and he took up the task of 'squirreling' them under mounds of moldering leaves and snow piles. Task accomplished, he took one in his beak and flew off with it. After all that hard work, I guess it was time for coffee break! 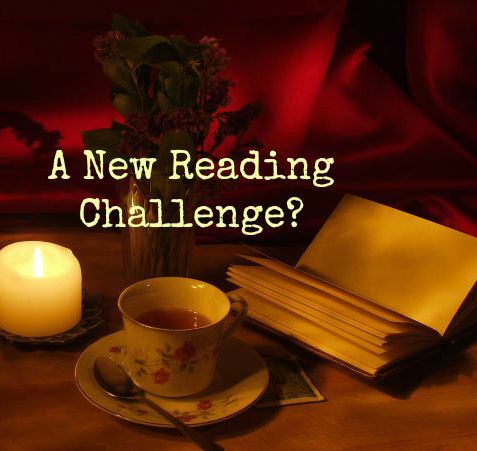 Book bloggers are already envisioning wonderful new reading challenges and projects to fill a brand new year. That means 365 whole days to enjoy all manner of reading pleasures, including the 2009 Read Your Own Books Challenge, for which I have now signed up. I've decided to challenge myself to read at least 53 books in 2009 that are from my own home library. I must admit I have quite a few on my shelves I never read it. Dear Hubby will be most happy to hear this, as this means I'm required to focus more on the books piling up everywhere around my house, and less on the ones still shelved at Chapters, Amazon, and quaint secondhand bookshops. The rules are simple. 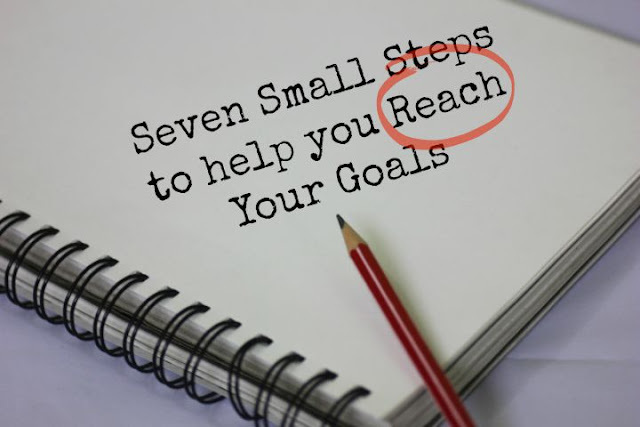 You set your own goals and read your own books during 2009. If you'd like to join the challenge, click here. I stared at the box of chocolates I was holding in my hand. An unexpected pleasure, they'd arrived with a note from a friend in response to a letter and gift book I'd sent her a couple of weeks earlier. Although I didn't realize it at the time, my friend had been feeling quite despondent; she was leaving her job with an organization that had been 'home' for 30 years and she was finding out how deep her roots had gone down. When I first heard that she was resigning, I felt a quiet urging inside to send her a note of encouragement. Almost without thinking, I picked up my pen that evening and words tumbled out. They came as a spontaneous thought... send her something that helped you during your own experience of dramatic change; give her the image that, like any plant being transplanted, she may feel and look a bit wilted as she adjusts and sets down new roots, but soon she will flourish in her new environment. In her note, my friend told me that I had shared exactly what she needed to hear. My words had given her a glimmer of hope that, yes, there would be life after this job. My heart was bursting out at the seams with the wonder of it. I loved it! As a writer, this is what it's all about...bringing the right message to the right person at the right time, and being so bang on, that in a twinkling someone's life is changed and their spirits are lifted. By the way, my friend is now established in her new position and LOVES it! 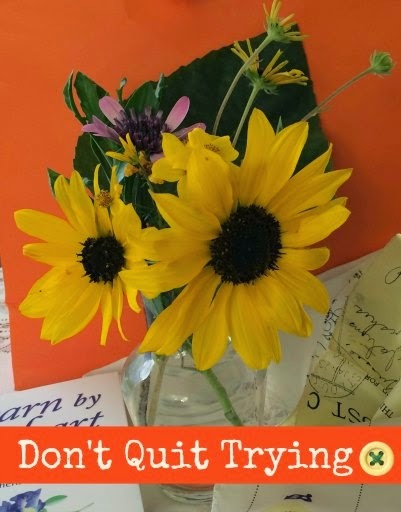 She says she still reads my note and the book I sent....and is now even considering passing it along to someone else who is facing her own set of challenges. To me, that's working with the Divine to bring about a little 'heaven on earth'. 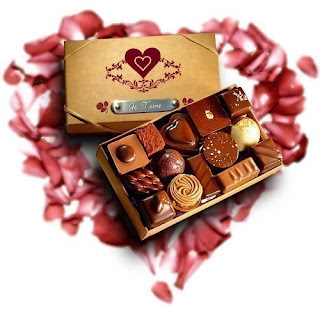 And you may be interested to know, the chocolates were celestially divine too! "It is in the smallest details that the flavor of life is savored." 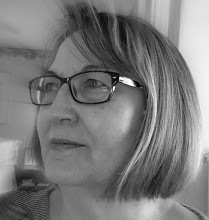 So wrote Sarah Ban Breathnach in her book Simple Abundance: A Daybook of Comfort and Joy. And how, if we pay attention to the beauty around us, we will enrich our lives and become more content. One way we can begin this habit of paying attention is to keep a daily gratitude journal, and at the end of each day, take a few minutes to write down five things for which you are grateful. The first time I started a gratitude journal was many year ago now, but I still I remember waking up those mornings during that season. 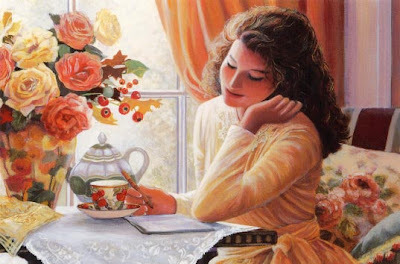 I woke with a sense of eager anticipation, wondering what new joys might be uncovered and what new things I might be able to jot down later that evening. That time at the end of each day soon became a cherished quiet time for me. The little exercise set in motion a pattern of looking for joyful moments and beauty in every corner of my life. 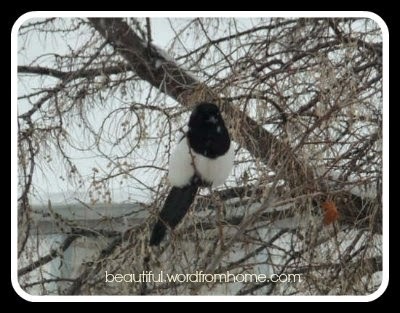 I grew amazed at how many blessings liberally sprinkled my days, things I'd never really noticed before. I began to focus on the abundance all around me rather than the lack. 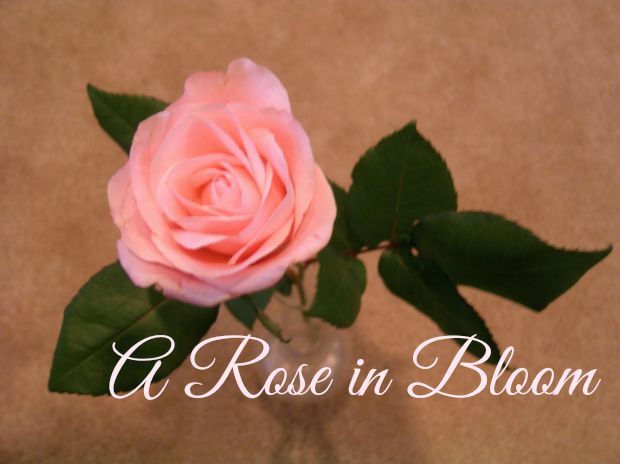 That's not to say my life was a proverbial bed of roses; I had my challenges, some of them severe, but I was learning to look for, and find, the smallest of beauties in the midst of the larger trials. Like tiny bunches of violets suddenly springing up in most unfriendly places, there they were adding colour and beauty, not to mention the hope to carry on. If you are finding that your own life could be sweeter, may I recommend that you find yourself the prettiest, most inviting notebook... and begin the delightful habit of jotting down those simple pleasures for which you are grateful. You will find yourself living your life more beautifully. Living a life of gratitude has made me happier. Even though I don't jot something down every single day now, I've never forgotten the lesson. Methinks someone was sprinkling powdered sugar over the doughnuts Upstairs last night for we woke to find the neighbourhood covered with powdery white stuff again. 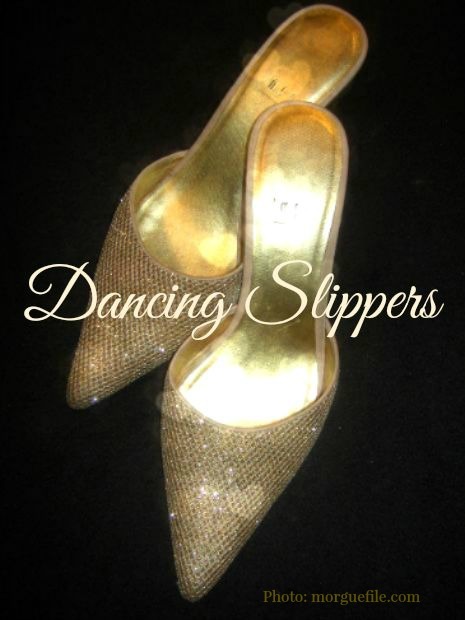 Or... it could be craft sparkles and glitter. Maybe the instructors forgot to put the lids back on the glitter jars. You see, yesterday a friend and I went to a Stampin' Up Christmas card workshop. Above is a pic of one card we worked on. 'Twas a fun afternoon playing with paper, stamps, ribbon, and glitz. Here's wishing you a lovely new day! be silent, sit close by, and nuzzle them. just pee on it and walk away! I love children's books and have been in love with them for as long as I can remember. 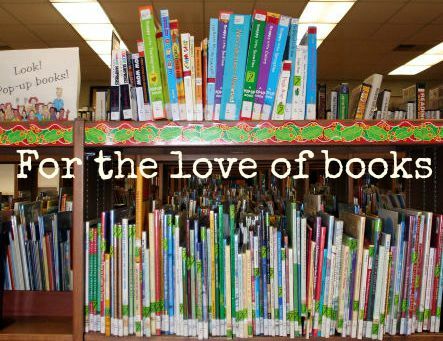 To this day, it's still a shivery, delightful pleasure to browse the shelves in the children's section at a library or bookstore. 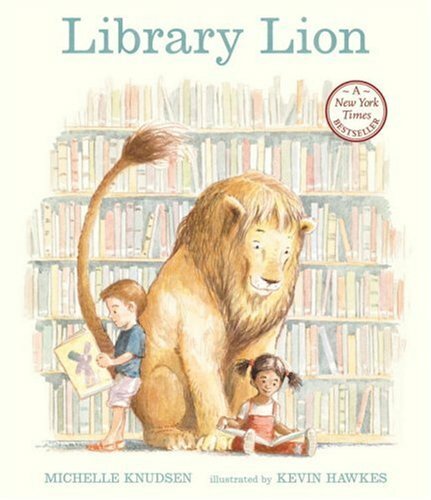 I especially love the large picture books with their vibrant illustrations and artwork. 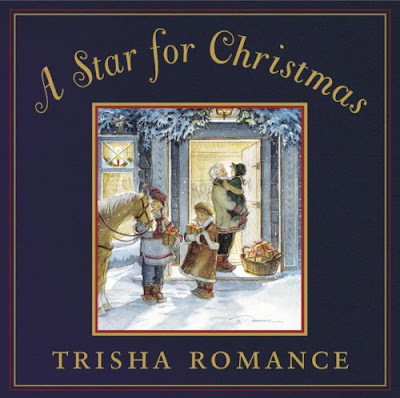 With it drawing near to the time of year when people start thinking more earnestly about holiday gift-shopping, I'm sharing a few other of my favourite storybooks in case you need to buy for little ones -- or as the case may be -- not so little ones, like elderly aunts or grandmothers who need tickling in their funny bones. 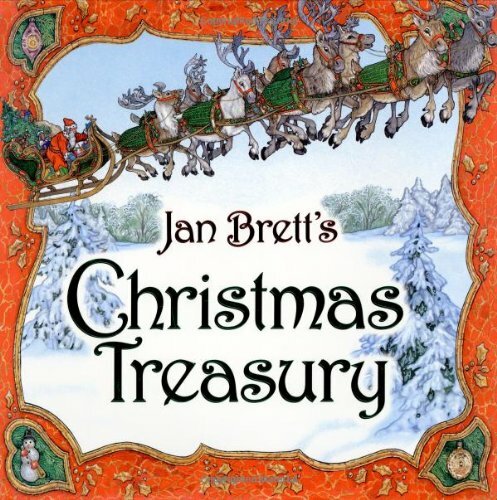 And, of course, what fun to pass along some of our own favourites to our children, grandchildren, nephews, and nieces, sharing in the delight of stories that make us giggle or sigh with understanding. The short list below is not of newly published books. These books have been around awhile now, but as they still remain some of my favourites not only for their stories but their wonderful illustrations, I'm sharing with you today. 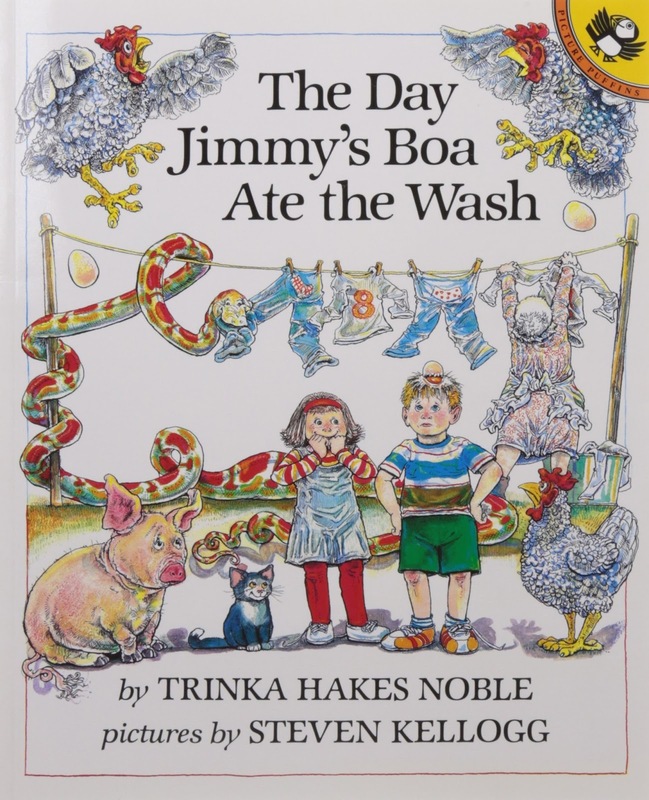 The Day Jimmy's Boa Ate the Wash written by Trinka Hakes Noble and illustrated by Steven Kellogg. 1992. 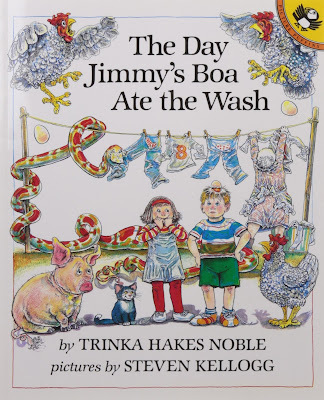 I was introduced to the book by a dear friend who made me realize it was quite fine to enjoy reading children's storybooks even if I was 25 or 26 or 27. For years now I count this charming story among my favourites. It's an engaging tale about a school field trip gone delightfully awry. Responding to her mother's query about her day, one child says, 'Oh...it was boring...kind of dull...nothing much. Well, until the cow started crying." Why was the cow crying? "Oh because the... ." And the tale spins out from there. 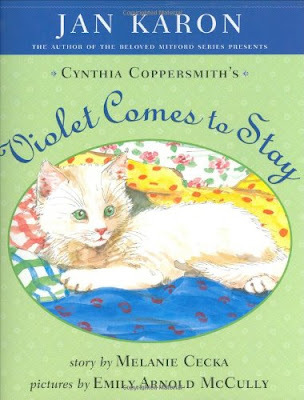 Cynthia Coppersmith's Violet Comes to Stay Story by Melanie Cecka, Pictures by Emily Arnold McCully. 2006. 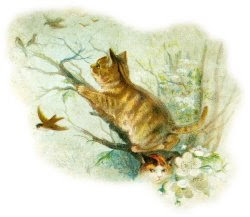 The first in a series of storybooks about a white cat inspired by Cynthia Coppersmith, Father Tim's wife from Jan Karon's bestselling Mitford Years series. In this story, Violet's search for 'home' leads her to a plant nursery, a bakery, and finally a bookstore—the one place where the gentle cat isn't expected to be a mouse hunter. I get happy just thinking about books. You too? 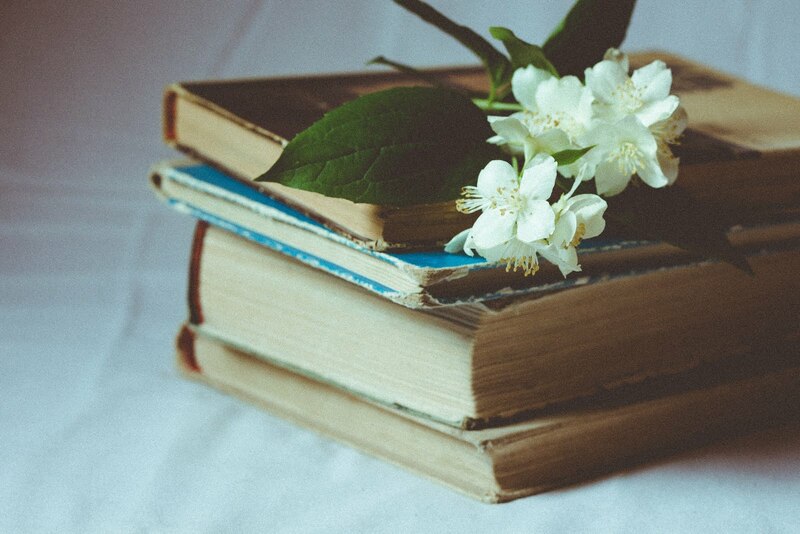 Although I have many interests and enjoy various creative ventures, the one thing that has stayed constant over the decades has been my love of books and reading. The past couple of days I've been browsing through some great reader/book blogs. I love the fact that we get to 'meet' so many interesting people who share kindred interests. Today I'm joining Booking Through Thursday. Each week a book-related question is posed by our blog tour host for readers to ponder and provide comments, if they wish. "I’ve asked, in the past, about whether you more often buy your books, or get them from libraries. What I want to know today, is, WHY BUY? Even if you are a die-hard fan of the public library system, I’m betting you have at least ONE permanent resident of your bookshelves in your house. I’m betting that no real book-lover can go through life without owning at least one book. So … why that one? What made you buy the books that you actually own, even though your usual preference is to borrow and return them? If you usually buy your books, tell me why. Why buy instead of borrow? Why shell out your hard-earned dollars for something you could get for free?" Once upon a time when I was trying to ’simplify’ my life, I thought I should stop buying so many books and just borrow them from the library whenever possible. (After all, the library is one of my favourite haunts). Turns out…simplifying and streamlining my home in the area of books did NOT work for me. Because when I tried to keep notebooks and index cards of all the quotes and good ideas I wanted to remember from these borrowed books, it made a bigger pile (and mess) than if I’d just bought the book and put it on a shelf! I most often buy non-fiction, because I want to be able to mark the thoughts and ideas that speak to me. I tend to remember where quotes are in a book once I’ve marked or underlined it, so it makes for easy reference. I’m more apt to borrow fiction from the library as some novels I may only read once and be done with them. Unless, of course, I find an author I really like (like Jan Karon, Agatha Christie, or L.M. 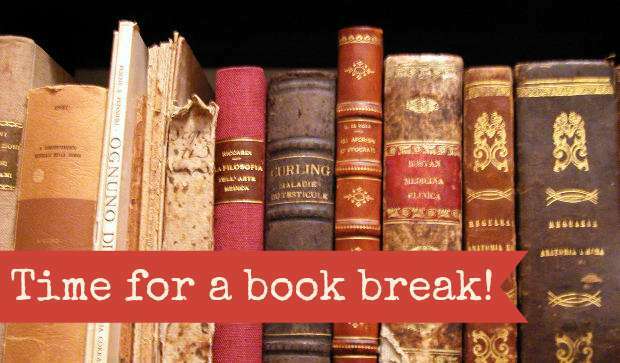 Montgomery, Rosamunde Pilcher, Alexander McCall Smith, Elizabeth Goudge, just to name just a few), then I'll buy those favourites to re-read over and over. The main reason I buy books is that the good ones become dear friends, and I like to have my chums nearby. A person never knows when the whim to read an old friend shows up, and it's lovely to them close to hand. There’s something quite invigorating about taking a newly purchased book home (or a pile of them on a good browsing day). It’s the perfect perk if I need new inspiration. It makes me feel like Scrooge when he’s gleefully rubbing his hands and counting his money — treasures, treasures, treasures! PS. If you're interested in participating in this book tour, you can copy the question from Booking Through Thursday and find out how you can post it on your own blog. PSS. I've been re-reading some of my old Christie favourites. Right now I'm in the middle of The Caribbean Mystery. 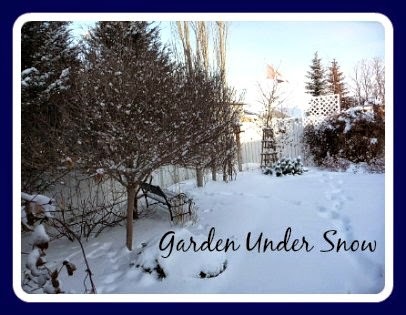 Yesterday morning we woke to a winter wonderland. It was totally unexpected to find our whole neighbourhood frosted over like wedding cake, when even the weatherman didn't warn us. But what a treat for the eyes! Every tree and shrub was festooned with heavy snow, branches laid low. And as the morning dawned and temperatures rose, there was that magical moment in the day when plops of snow melted from branches like candle wax. The current issue of Victoria came with a sampler CD of Christmas music performed by Editor-in-Chief, Phyllis Hoffman. What with the snowy day outside and an appetizer of holiday melodies inside, my appetite is whet for more. 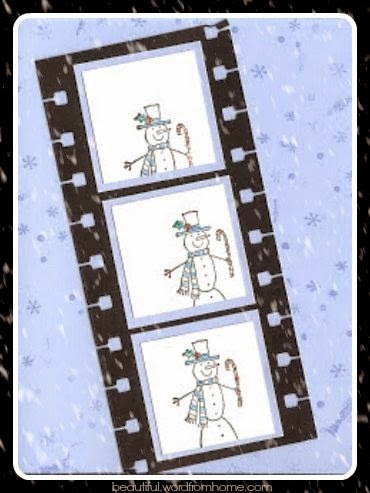 Maybe it's time to bring out the seasonal music and movies in earnest. Anyone else out there starting to feel it? 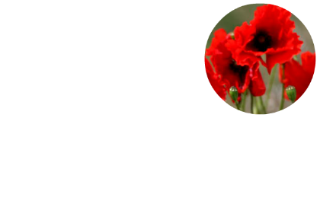 Today we stop, we remember, and we wear a red poppy to honour the many men and women who sacrificed their lives for their country and for freedom. 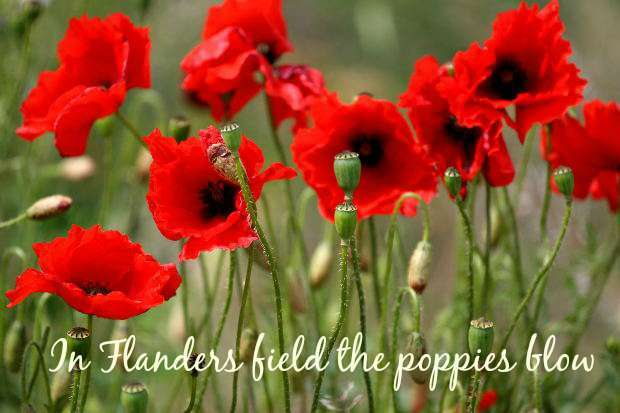 Many of us will remember the moving poem In Flanders Fields. I first memorized it with my classmates when I was in Grade 5, and ever since its solemn message continues to move me. May God help us to remember and never forget the sacrifices made ... may they not be in vain. 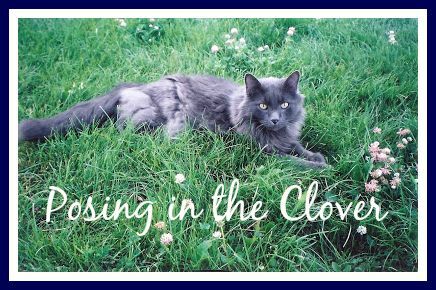 I quickly popped over to see my feline friends Gandalf and Grayson -- Grayson being the spittin' image of my own gray puddypuss who's posing here in the clover. It was deja vu watching Grayson wandering around in a little video. Not only does he look like my cat, Sullivan, he even has similar mannerisms. It was comforting to catch sight of this other kitty who lives thousands of miles away in another country, who reminds me of my own furry beast, who unfortunately got ill and moved to kitty heaven. 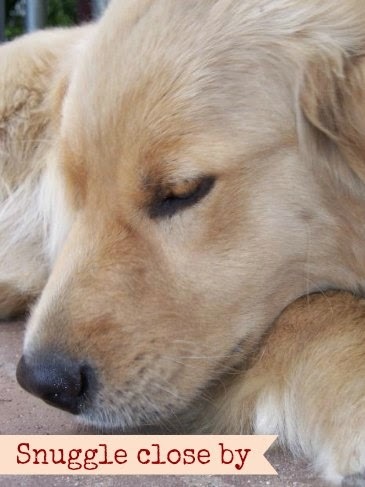 I sure do miss him and I miss putting my face into all that soft, sweet smelling fur. He'd purr and purr when I did that. 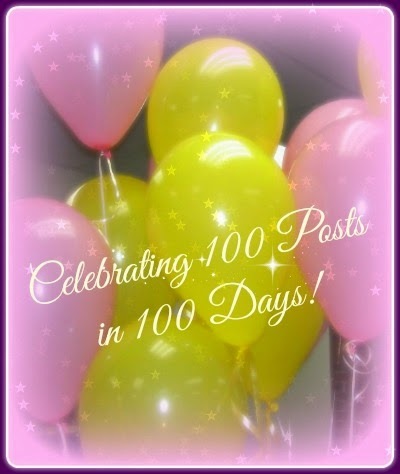 I am grateful today for this little glimpse of 'puddytat' heaven, and I'm grateful to Gandalf and Grayson's mom for sharing her videos with us here in blogland. They have been a real treat. When I let go and let Him take the weight of care I'm carrying, it isn't long before I begin to feel more peaceful in my mind. Sometimes I actually feel the peace draping around me like a soft, soft blanket. I feel less burdened as the weight of the world lifts from my shoulders and heart. I'm so grateful that Jesus invites us to come and receive his rest. What an amazing and freeing day. At a conference all day where the sessions revolved around the theme 'Reclaiming Your Identity'. It was about exposing the areas where people have picked up lies about themselves (often from the words of other people or what we believe about ourselves) and replacing those distorted images with the truth of who we are. So that we can be free to blossom into the glorious individuals God originally fashioned us to be. It was liberating and hopeful to be in a roomful of other people who shared the same longing to be free from any baggage that stunts our growth and our ability to bloom into our God-given destiny. I'm posting this at the end of the day. My heart is full tonight and I'd love to chat more. However, my body longs for its bed and so I'm away to mine. May you find sweet sleep in your bed tonight! I just bumped into an interesting site called Friday Fill-ins. The prompts looked interesting, so I decided to join the fun. My fill-ins are underlined. 1. My blueprint for success includes doing everything from a heart of passion and love, and including God in all I do. 2. A jube-jube was the last candy I ate. 3. The best facial moisturizer I've ever used is Mary Kay's TimeWise(R) Age Fighting Moisturizer. I love it! 4. Reading with a purring kitty cat on your lap can be good therapy. 5. I'd like to tell you about the joy I feel in knowing that God loves me (and all of us) with His whole heart. 6. Being mercy-motivated is my strongest characteristic. 7. And as for the weekend, tonight I'm looking forward to attending a conference on healing the heart, tomorrow my plans include the rest of the conference and Sunday, I want to attend a Baroque music concert in the afternoon with my favourite Honey-Bunny! We've been watching one of our favourite movie sets A Year In Provence with John Thaw and Lindsay Duncan. We're watching the 3rd set this evening -- July, August, September -- so the mayhem really begins. This series is based on Peter Mayle's bestselling book by the same name. As someone on Amazon already posted, this book is "part memoir, part homeowner's manual, part travelogue, and all charming fun." Exactly how I'd have said it if I would have thought of it first! With lots of great scenery and food stories, entertaining encounters with new neighbours and unexpected visitors, it almost makes a person want to go and find a piece of Provencal paradise for themselves. And if you can't do that, this DVD series makes you feel like you are there. Day 80. What Motivates You? I readily agree with former race car driver Mario Andretti when he said that desire is the key to motivation. I rarely have trouble to start on a project when I am excited about it. Do you? It's easier to stay consistent with a goal when we're motivated, and we stay motivated when we have a real desire to accomplish something. But my question is, how do we get -- and stay -- motivated when we don't have the heart's desire in the first place? For instance, I know I should go to the gym with my husband to exercise. I went for a season, then I got busy (and bored). I haven't been for ages (and I'm not telling you how long either). In my head, I know that exercise is good; research confirms it. Yet still, that doesn't motivate me to regularly put on my walking shoes and get moving. So how can we increase our desire to complete a task or project, when it doesn't excite us in the first place? 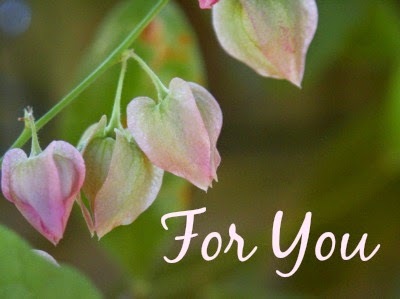 Here are a couple of thoughts in seed form -- see what you think. For me, it's not so much about having the right information, but somehow my heart and imagination needs to be involved. I need to be able to connect to it emotionally. When we feel something at the emotional heart level, we generally act on it. We could be motivated to exercise by fear, such as fear of heart disease. 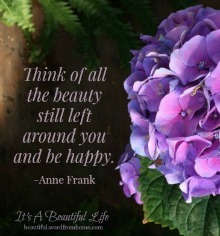 But that hardly makes for living a more beautiful life. Fear is not a good motivator. This blog, for example. I love working and writing on it. Why? Because beauty, love, and creativity are involved. 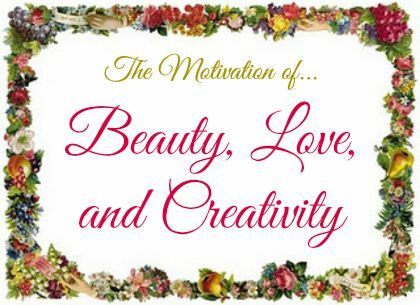 Beauty motivates me, loving others motivates me, and creativity motivates me. When I'm writing, I have my heart's desire because I'm writing about things that matter to me, and because I'm focusing on what makes life more beautiful for myself and others. So I don't need anyone telling me I should do this. Which makes me wonder if I could incorporate these motivators into the goal of exercising. How could I make exercising more beautiful? Going for a brisk walk in the great outdoors where I feel the sunshine and smell the earth would be much more satisfying than walking round and round where you fight for space with everyone else on a gym track. Could love or loving be included? 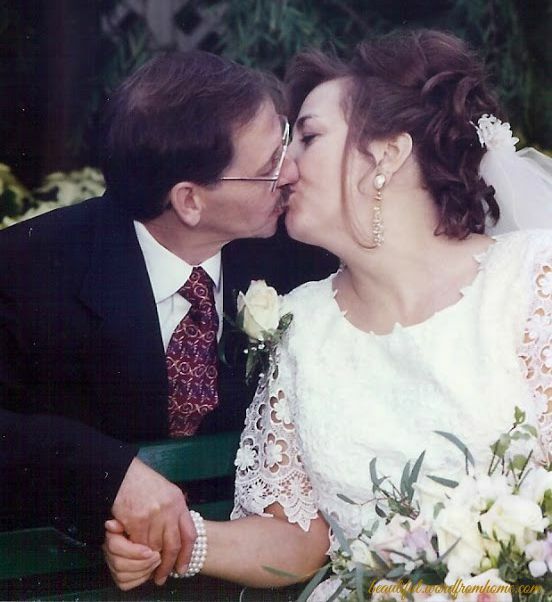 Well, I could think more long term here -- as my husband gets stronger and more fit, it's not appealing to think of offering him a weaker, flabbier partner. That would hardly be fair now would it? And second, it's not very loving towards me. I want to be healthy, strong and able to enjoy the life we have...together. So that desire could motivate me. Now, how about something creative? What's creative in exercising, you ask? Have a variety of choices of activities that I already enjoy -- walking, dancing, biking. But what if I did some research to find activities that I would actually enjoy? Like dance lessons. Participate in more than one activity so there's a variety of focus, pace, and place. Got any ideas? I'd be interested in learning what positively motivates you? Day 79. But That's Just The Way I Am! 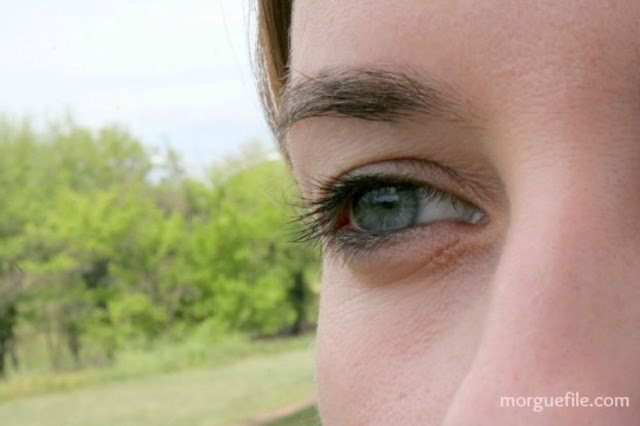 Have you ever thought about how you see yourself? Anna Johnson, author of Three Black Skirts says if we see ourselves as messy, disorganized, not good with paper, then we will have plenty of excuses to fall back on, and we'll keep affirming the current habit or situation. Sometimes we don't see that we're the ones reinforcing our beliefs about ourselves by the words we keep saying over and over. 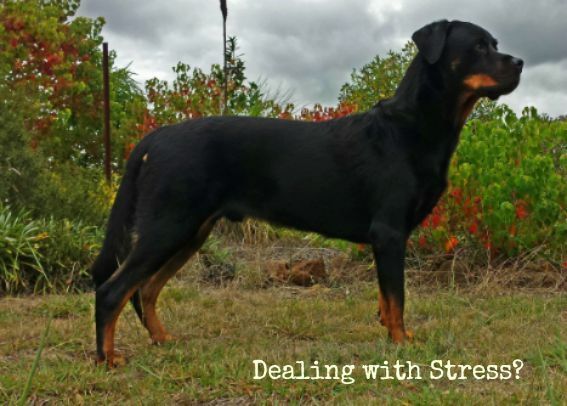 When our mind and heart, consciously and subconsciously, keep hearing things like, "I'm messy, I'm not good with grammar, I'm terrible at technical things", our inner self then strives to fulfill that message. My Personal Experience. I used to say I was always tired. Every time I'd say I was tired, I'd feel even more tired. So I'd complain again about how weary I was, and every time I spoke the words, the more exhausted I felt. One day it clicked that the more I confessed I was tired, the more exhausted I felt. I was actually perpetuating my tiredness by repeatedly telling myself that I felt that way. In essence, I was reaping the harvest of my words. So I stopped saying it. Believe me, it wasn't easy at first, I was so used to saying it all the time. But then gradually I began to notice a shift and my body started to actually feel less tired all the time. Which to my way of thinking is why it's important to watch our vocabulary, as well as to be aware of thinking we can't change things because 'that's just the way we are'. There's so much evidence out there these days that indicates we can shift our thinking, so there's no reason why we have to continue that way, unless we truly prefer it. If you're like me and ready to throw out the old excuses about why you are a certain way, look at what you're telling yourself and begin to change that unwanted message, and see if you don't begin to experience a shift. We don't have to be a victim of past habits -- we can change our minds for something better, something more beautiful. Day 78. What Colour is Your Monday? I have not always liked Mondays. When I worked full-time, it was wonderful to have the weekend off, but how hard to get back into the swing of getting up early, facing traffic, and settling down to the routine at a desk on Monday morning. I found myself, along with a whole bunch of other people, feeling the blues... on Blue Monday. Then I heard someone years ago say when we decide to have a Blue Monday, it translates into the fact that we're in actuality spending one seventh of our lives in a state of depression or unhappiness or moodiness. Oh my, what an eye opener for me. Looking at it from that perspective, I knew that's not how I wanted to spend any part of my life. I changed my attitude and began to look for ways to celebrate my Mondays. I started living my life more beautifully. clearly evident and unmistakably authenticated. If we believe in healing, we need to get healed. 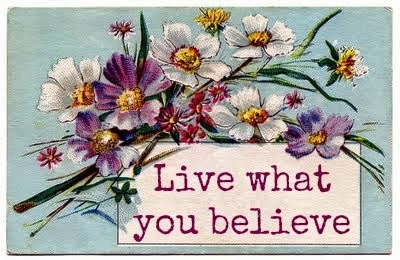 If we believe in blessing, we ought to be blessed. If we believe in love, we ought to be loving people. 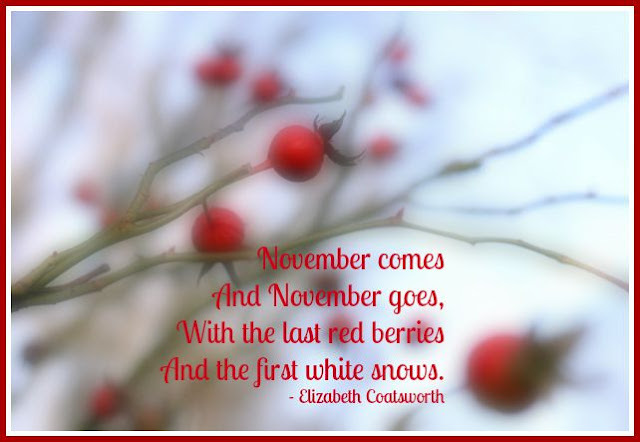 With the start of this new month my thoughts turn early towards the coming winter, holidays and what I think of as the cozy time of year. I've often lamented out loud at how 'soon' the shops and malls start decorating for Christmas (right after Hallowe'en). I guess what I'm really protesting is the commercialism that tries to make this season only about buying and spending. Because, in my secret heart o' hearts, as the days get cooler and the nights close in around our windows sooner, I don't mind thinking ahead to my favourite time of year. 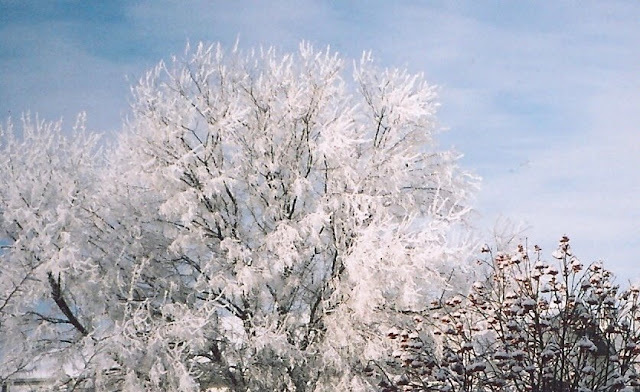 I love winter and I love Christmas and, in my imagination, the two are always intertwined. I love wondering what how to slowly start bringing in touches of winter around the house, how I might want to decorate for the holidays. One important project is deciding what theme my Christmas cards will be, and whether I buy them or craft them myself. Oh, and what fun it is to scout out neat presents for the people I love, trying to capture a little box of joy bubbles that will pop out on the recipient when the wrapping paper hits the floor.